Professor Richard Impossible in The Venture Bros.
2010 A Colbert Christmas: The Greatest Gift of All! Stephen Tyrone Colbert (pronounced col-BEAR) (born May 13, 1964) is an American actor, comedian, and author. He is the current host of The Late Show with Stephen Colbert. He was the host of The Colbert Report on Comedy Central from 2005 through 2014. Colbert has used a special form of comedy called satire to make fun of politicians and the news media. Colbert was born in Washington, D.C.. He grew up in Charleston, South Carolina. He was the youngest of eleven children in a Catholic family, and went to Northwestern University. On The Colbert Report (which he pronounces "col-BEAR re-POAR" to make the words sound the same), he pretends to be a right-wing talk show host. He likes to ask his guests very embarrassing questions that make it seem that he is a serious far right-wing conservative who is also not very smart. His TV personality centers on the idea that if enough people believe something, it will be true. This is largely based on conservative host Bill O'Reilly. He was granted a Super PAC for the South Carolina Republican Party primaries in the 2012 U.S. presidential election. Many famous American politicians and people in the news media agree to appear on his show because it is very popular. 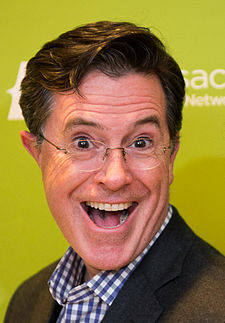 Colbert started as a comedy writer and performer for many other programs, such as The Daily Show and the Strangers with Candy movie, both also on Comedy Central. On April 10, 2014, CBS announced in a press release that Colbert will succeed David Letterman as the host of The Late Show, effective when Mr. Letterman retires from the broadcast." On January 12, 2015, CBS announced that Colbert would premiere as the Late Show host on Tuesday, September 8, 2015. He has also voiced Phil Ken Sebben and Reducto in Harvey Birdman, Attorney at Law. Colbert has written three books. I Am America (And So Can You!) was No. 1 on The New York Times Best Seller list. Colbert married his wife in 1993. He lives in Montclair, New Jersey with his wife and three children. He has made a word, 'truthiness'. At least four species have been given scientific names honoring Colbert. ↑ Sternbergh, Adam (October 16, 2006). "Stephen Colbert Has America by the Ballots". New York. Retrieved January 7, 2014. ↑ Rabin, Nathan (2006-01-25). "Stephen Colbert". The A.V. Club. The Onion. Retrieved 2014-01-07. ↑ Rabin, Nathan (January 25, 2006). "Stephen Colbert interview". The A.V. Club. The Onion. Retrieved January 7, 2014. ↑ Dowd, Maureen (November 16, 2006). "America's Anchors". Rolling Stone. Archived from the original on December 9, 2006. Retrieved December 9, 2006. ↑ King, Larry. "Interview with Stephen Colbert". Larry King Live. October 11, 2007. ↑ Steinberg, Jacques (October 12, 2005). The News Is Funny, as a Correspondent Gets His Own Show. The New York Times. Retrieved on July 13, 2006. ↑ 9.0 9.1 Corddry, Rob. Interview with Terry Gross (March 8, 2007). Rob and Nate Corddry Find Their Place on TV. Fresh Air. WHYY. Retrieved on October 28, 2007. ↑ Deggans, Eric (June 1, 2008). "For Aasif Mandvi, cultural irreverence on 'The Daily Show'". St. Petersburg Times. Retrieved January 7, 2014. ↑ "Colbert's mock anti-Canada feud spirals on the Web". Retrieved 2009-12-04. ↑ Solomon, Deborah (25 September 2005). "Funny About the News" – via NYTimes.com. ↑ Shear, Michael (June 30, 2011). "Colbert Gets Permission to Form Super-PAC". The New York Times. ↑ "CBS Announces Stephen Colbert as The Next Host Of The 'Late Show'". Press release. April 10, 2014. http://cbspressexpress.com/cbs-entertainment/releases/view?id=38627. Retrieved April 10, 2014. ↑ Collins, Scott (January 12, 2015). "Late Show With Stephen Colbert' will premiere Sept. 8, CBS says". Los Angeles Times. ↑ Milanese, Marisa (11 June 2015). "Celebrity Parents: Stephen Colbert". Parents. ↑ "Language Log: Truthiness or trustiness?". itre.cis.upenn.edu. ↑ Bond, Jason. "How to Name a Species – Taxonomy and Why it is Important". East Carolina University. Archived from the original on September 17, 2008. Retrieved August 3, 2008. ↑ Bond, Jason; Stockman, Amy (2008). "An Integrative Method for Delimiting Cohesion Species: Finding the Population-Species Interface in a Group of Californian Trapdoor Spiders with Extreme Genetic Divergence and Geographic Structuring". Systematic Biology 57 (4): 628–646. doi:10.1080/10635150802302443. PMID 18686196. http://sysbio.oxfordjournals.org/content/57/4/628.full. "The specific epithet is a patronym, named in honor of Mr. Stephen Colbert. Mr. Colbert is a fellow citizen who truly has the courage of his convictions and is willing to undertake the very difficult and sometimes unpopular work of speaking out against those who have done irreparable harm to our country and the world through both action and inaction. He will be especially remembered by many of Jason Bond's generation for his speech at the 2006 White House Correspondents Dinner". Watson, Bruce (May 29, 2014). Stephen Colbert: Beyond Truthiness. New Word City. ASIN B00HYY3I18. ISBN 9781612307572. OCLC 870136575. Colbert in an open, hour-long interview and Q & A session arranged by Harvard's Institute of Politics. He speaks about the nature of his TV-show character and the interplay between wearing the mask and using it to make political points.